Neighborhood Fire Safe Councils are a foundation for fire preparedness in our communities, and one of the primary goals of the Mendocino County Fire Safe Council is to encourage every neighborhood in the county to develop their own. Neighborhood councils are what their dedicated leaders make them, meeting local needs with the energy and resources they have available. Our far-flung communities are incredibly diverse, and neighborhood councils do and should reflect that diversity. If you are interested in starting a neighborhood FSC, the first step is to talk to your neighbors and build a strong place-based network. Because FSCs really are what their leaders make them, their processes, structures and goals vary considerably. 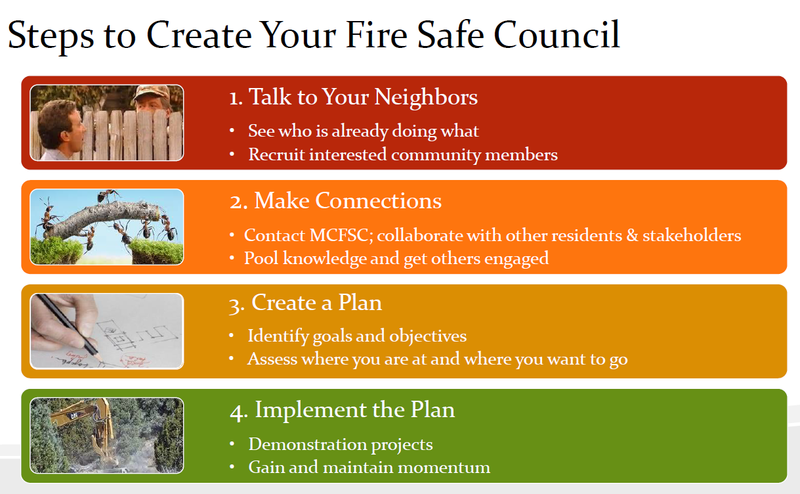 The Fire Safe Council Handbook, from the California Fire Safe Council, offers clear and helpful guidance for reaching out and organizing your neighbors as a new council. Please take a look at the handbook, begin talking to your neighbors, and contact the Mendocino County Fire Safe Council for further assistance. Also, once your council is underway, please fill out the Fire Safe Council Info Form and send it to us, so that we know who you are, what you aim to accomplish, and how we can best contact you.